The gun-toting woman holds enormous symbolic significance in American culture. For over two centuries, women who pick up guns have disrupted the popular association of guns and masculinity, spurring debates about women's capabilities for violence as well as their capacity for full citizenship. In Her Best Shot, Laura Browder examines the relationship between women and guns and the ways in which the figure of the armed woman has served as a lightning rod for cultural issues. Utilizing autobiographies, advertising, journalism, novels, and political tracts, among other sources, Browder traces appearances of the armed woman across a chronological spectrum from the American Revolution to the present and an ideological spectrum ranging from the Black Panthers to right-wing militias. Among the colorful characters presented here are Deborah Sampson, who disguised herself as a man to fight in the American Revolution; Pauline Cushman, who posed as a Confederate to spy for Union forces during the Civil War; Wild West sure-shot Annie Oakley; African explorer Osa Johnson; 1930s gangsters Ma Barker and Bonnie Parker; and Patty Hearst, the hostage-turned-revolutionary-turned-victim. With her entertaining and provocative analysis, Browder demonstrates that armed women both challenge and reinforce the easy equation that links guns, manhood, and American identity. Women Hunting in Alaska. Cunningham. Christine Cunningham was born in Sitka, Alaska in 1978. Although she spent much of her life wandering the woods alone, hunting did not come to her until later in life. Unlike many women hunters, she didn't have early role models who hunted. However, her early experiences of the outdoors gave her nature as a source for truth. No matter how much time she spent in the field as an "outsider," it wasn't until she began hunting small game that the beauty and realities of the outdoors really came to life for her. Christine wrote about her first experience duck hunting for Alaska Magazine in 2008 and shot her first 25 straight at trap in 2012. As she became more involved in the hunting and shooting community, she also became active in many wildlife conservation and preservation organizations. She volunteers her time as a Hunter Safety Instructor for the Alaska Department of Fish & Game's Hunter Education Program and participates as an instructor for women and youth shooting events. As she developed her skills, she realized she needed a hunting dog and has since expanded her hunting family to include six sporting dogs (three chocolate labs, two English setters, and an Irish setter), who live for the mountains, woods, and tidal flats. As Christine began to connect with other women who were living a similar life, she was captivated their many stories and recollections. In 2012, she embarked on a book project that would share the stories of 17 women hunters. Women Hunting Alaska is her attempt to bring the reader into the world of the woman hunter in Alaska--the high risk and visually spectacular world of the last frontier through the eyes of hunting's largest growing segment. The stories are those of real women hunters who live within and utilize the wild lands of Alaska. Their stories, although remarkably different, are a still vital remnant of the frontier lifestyle where women are extremely self reliant, independent and thoughtful. They are also full of adventure, compassion, and life itself. The selection of the women featured happened by chance, and there are still many other women with similar stories and a far greater wealth of these exist than could possibly be included in one volume. The stories were not predetermined, and it was important to Christine that the stories reflected each woman's style of hunting rather than her own. She discovered that for each of them, the meaning of a hunt was developed over time and was, like her own experience, a confluence of how each were raised, how they had lived and grown, and the place they finally found themselves. Christine believes that women are the future of hunting. They have the privilege of defining a new tradition in the field, and she is eager to see what women will become to each other at a point in time when a new definition of what it means to be a hunter emerges. What happens when a classically-trained New York chef and fearless omnivore heads out of the city and into the wild to track down the ingredients for her meals? After abandoning Wall Street to embrace her lifelong love of cooking, Georgia Pellegrini comes face to face with her first kill. From honouring that first turkey to realising that the only way we truly know where our meat comes from is if we hunt it ourselves, Pellegrini embarks on a wild ride into the real world of local, organic, and sustainable food. When Lily Raff McCaulou traded in an indie film production career in New York for a reporting job in central Oregon, she never imagined that she'd find herself picking up a gun and learning to hunt. She'd been raised as a gun-fearing environmentalist and an animal lover, and though a meat-eater, she'd always abided by the principle that harming animals is wrong. But Raff McCaulou's perspective shifted when she began spending weekends fly-fishing and weekdays interviewing hunters for her articles, realizing that many of them were more thoughtful about animals and the environment than she was. So she embarked upon the project of learning to hunt from square one. From attending a Hunter Safety course designed for children to field dressing an elk and serving it for dinner, she explores the sport of hunting and all it entails, and tackles the big questions surrounding one of the most misunderstood American practices and pastimes. Not just a personal memoir, this book also explores the role of the hunter in the twenty-first century, the tension (at times artificial) between hunters and environmentalists, and new models of sustainable and ethical food procurement. They Fought like Demons. Blanton, Cook. “Albert Cashier” served three years in the Union Army and passed successfully as a man until 1911 when the aging veteran was revealed to be a woman named Jennie Hodgers. Frances Clayton kept fighting even after her husband was gunned down in front of her at the Battle of Murfreesboro. And more than one soldier astonished “his” comrades-in-arms by giving birth in camp. This lively and authoritative book opens a hitherto neglected chapter of Civil War history, telling the stories of hundreds of women who adopted male disguise and fought as soldiers. It explores their reasons for enlisting; their experiences in combat, and the way they were seen by their fellow soldiers and the American public. Impeccably researched and narrated with verve and wit, They Fought Like Demons is a major addition to our understanding of the Civil War era. Woman the Hunter. Zeiss Strange. Over two million American women hunt. By taking up weapons for the explicit purpose of killing, they are shattering one of Western culture's oldest and most firmly entrenched taboos. The image of a woman 'armed and dangerous' is profoundly threatening to our collective psyche--and it is rejected by macho males and radical feminists alike. Woman the Hunter juxtaposes unsettlingly beautiful accounts of the author's own experiences hunting deer, antelope, and elk with an argument that builds on the work of thinkers from Aldo Leopold to Clarissa Pinkola Estes. Exploring how women and men relate to nature and violence, Mary Zeiss Stange demonstrates how false assumptions about women and about hunting permeate contemporary thought. Her book is a profound critique of our society's evasion of issues that make us uncomfortable, and it culminates in a surprising claim: that only by appreciating the value of hunting can we come to understand what it means to be human. Controversial and original, defying easy stereotypes,Woman the Hunter is sure to provoke strong reactions in almost every reader. Explores the interesting women who hunted a variety of big game animals around the world. Women such as Lady Florence Dixie, Agnes Herbert, Osa Johnson, Grace Gallatin Seton, & Gladys Harriman hunted so well, they made names for themselves & wrote of their adventures. 200 pgs. The image that comes to mind when you think of big game hunters is of African safaris with men carrying enormous guns hunting exotic game. But there were women on those trips as well, and not just the trips to Africa, and they were often as successful at the hunt as the men. Women such as Lady Florence Dixie, Agnes Herbert, Osa Johnson, Grace Gallatin Seton, and Gladys Harriman hunted so well, they made names for themselves and wrote of their adventures. Divided into chapters detailing a specific time period, region hunted or individual woman, With Rifle and Petticoat explores the interesting women who hunted a variety of big game animals around the world. Isabel de Quintanilla married famed PH Tony Sanchez-Ariño in 1963, and rather than wait for him at home she decided to go along to see what Africa was like during the immediate post-WWII period. Once she became comfortable in that milieu, she was not content just to watch what her husband did on a daily basis—she also decided to give hunting a chance. This is her account of the countries she visited and hunted in over the last forty years: Guinea, Cameroon, Zambia, Kenya, Sudan, Tanzania, and the CAR. In spite of a dangerous bout of malaria and dengue fever, she remained at her husband’s side, tramping through Africa, and together they formed a hugely successful safari business. There are fascinating descriptions of wild Africa and the natives, safari clients, and animals she encountered along the way. In addition, Isabel became an elephant hunter herself and an accomplished one at that. Her chapter on the Pygmies of the Congo basin is especially worthwhile. Margarete Trappe was many things: She was the first woman to become a professional hunter in Africa, she spied for General von Lettow Vorbeck during World War I, she lost her farm, Momella, twice to the authorities, and she had pretty much a disastrous marriage. Despite it all, she kept a fantastic demeanor. She guided the nobility and royalty of continental Europe for big game in East Africa. Besides that, she ran a farm, which included livestock, looked after the local natives who revered her, and raised four kids. (As an aside, her offspring are still active on the East Africa hunting scene.) But her most interesting time, and a great part of this book, are the years before, during, and after World War I (up to World War II). Margarete Trappe and her husband, Ulrich, arrived in German East Africa in 1907 (now Tanzania). They walked on foot to the vicinity of Mount Meru and hacked a farm out of the wilderness. Her life took a huge turn with the advent of World War I. Ulrich had left to serve in the German army, and she was left alone to fend off all troubles. She did the best she could to keep the farm going and, at the same time, spy for the Germans. But after the British won, the day of reckoning came, and it came with a vengeance. She was forcibly removed from her farm by the authorities. Through chance and pluck, she regained her farm and then became fully established as a PH. She gained a very good reputation, and times got better for her till World War II arrived. It was déjà vu all over again, only twenty-six years later. Margarete Trappe was a remarkable woman with a huge amount of determination, and her biography by a very talented author is sure to inspire all those who read it. The story of Judy Opitz, born in England, who worked with WWII pilots in the '40s, acted on stage in the '50s, travelled to Australia in 1958, and who fell in love with the remoteness of the Kakadu region, where she and her husband ran the Cooinda Motel. At 84, Judy was awarded her doctorate from CDU. “Far from a collection of gory tales about animal killing, this elegantly edited anthology is a tribute to the women who have forayed into the male-dominated world of hunting. . . .As intriguing as this book might be for hunters, it may be even more so for women who have never experienced the sensation of travelling through the forest with a gun, since reading about hunting lions at night, for example, offers a glimpse into a state of mind that’s far from ordinary. For close on two centuries, books have been written about the hunting feats of men, but very little has been published concerning the numerous women who hunted during this period. 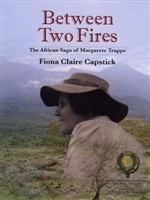 Fiona Capstick’s extensively researched book reveals that these hunters were not alone; she has spent years delving into diaries, journals, articles, and books written by or about the world’s many unsung huntresses, tracing their role in hunting from the early gatherer-hunter societies to the incredible accounts of the sportswomen who made their mark in the world’s hunting fields in the late nineteenth century. The huntresses are legion and include Florence Baker, wife of famed Sir Samuel, who saved her husband’s life during a charge with a single, well-placed bullet; the Herbert cousins, Agnes and Cecily, who hunted on three continents almost a century ago; Isabel Savory, a real sportswoman and a forerunner of today’s ecotourist; Minna Jenkins, who hunted in Tibet in 1906; and Margarete Trappe of East Africa, who, having lost her farm in Tanganyika after World War I, became the continent’s first female professional hunter; and a great many other women who proved that they could hunt dangerous game as skillfully as any man, and whose self-sufficiency allowed them to venture into the depths of the wilds accompanied only by their local porters and guides. Copyright © 2013 Bunduki Books. All Rights Reserved.